Amazon has not price-matched these; they go for $465 there and they ship immediately. Surprise, surprise! This is why we price-check things 🙂 The new condition HIDIZS AP60 Ⅱ digital audio player goes for $130, BUT when you look closely on the product page, it has a $30 OFF clip-on coupon. 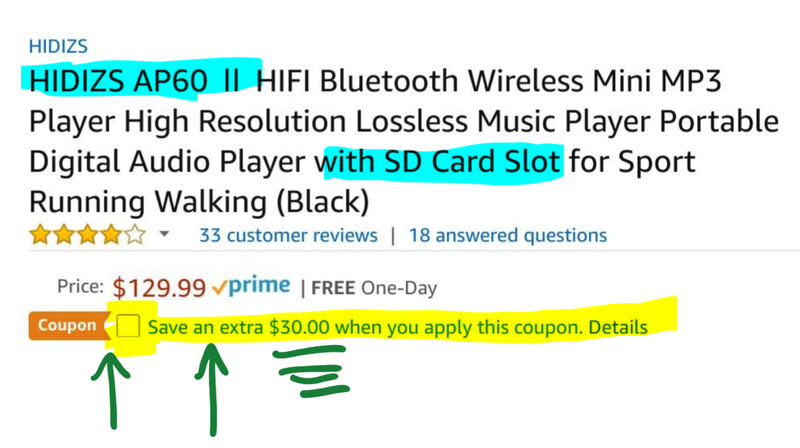 You clip that coupon (click on the little box or the coupon text) and you get $30 off, making it $100. You don’t have to type anything with clip-on coupons; just click. The coupon is available for multiple color schemes of this DAP! It looks like a couple of “fulfilled by Amazon” marketplace sellers have price-matched each other, they are offering the new condition Sennheiser MM 50 iP earphones for $15 with free shipping for Prime members or with a $25+ order. These average 3.8 out of 5 based on 320+ customer reviews. For a limited time, Groupon is offering FREE three month Pandora Premium music subscriptions. Premium is a normal streaming service, not a radio service like their more famous Pandora Radio. It goes for $10/month like most other streaming services. The offer is good for new customers. Check terms/conditions there for more details. A few prizes (AKG M220 and K7XX) unlock if certain quantities are purchased during this promotion. Each member can buy two grab bags. Each grab bag is randomly selected, there’s on guarantee you will receive two different earphones if you buy two grab bags. A maximum of 1000 units is available for this drop. Over 150 of them have been sold as of the time of writing. These will ship in early April 2018. There is no mention of warranty in the listing. Another one of the weekly Harman/JBL deals is the factory recertified JBL Everest 300 Wireless On-Ears going for $45 with free 2nd-day Air shipping and a 1-year warranty in your choice of multiple color schemes. This is backordered but you can still order it if you like the price. Limit up to five per customer. The wireless part is Bluetooth 4.1. Planar temptation! BuyDIG is now offering the open-box HIFIMAN HE400i Special Edition (the dark blue chrome color scheme) for $120 with free shipping and free returns. That’s right $120! This is an open-box closeout sale of the “while supplies last” kind. They are open-back over-ear planar-magnetic headphones. Certainly not a bad price! The biggest risk is Hifiman’s quality control with their headphones falling apart, so keep that in mind [check various audio forums for more on that front]. Under “Package Contents” it says this comes with a 1-year warranty. Further down the product listing there’s also an option for a Mack 3-year extended warranty for $20 more. Speaking of BuyDIG, they are offering the new condition Teac TN-400S Belt-driven Turntable with S-Shaped Tonearm in the gloss black color scheme for $229 with free shipping until March 3rd. No coupon/rebate needed. The end of month coupon has arrived for refurbished A4C (All 4 Cellular). Coupon FEB20 gets you 20% most things on their website (exclusions do apply). They have multiple pages of search results when you search for headphones at their website. They come in a variety of conditions, refurbished, used, new, new-other, so check each individual listing. This is a limited time end fo month coupon. The new condition RHA Dacamp L1 goes for $256~ in new condition, but if you are comfortable with used, there is a “Used – Acceptable” condition listing (various cosmetic impefections; damaged original packaging) for them for $179~ with free shipping by Amazon Warehouse Deals actual. Surprise! The AudioQuest DragonFly Red USB DAC/amp is finally available at a more reasonable used price! As of the time of writing “fulfilled by Amazon” marketplace seller “AmazinSavings” (93%) is offering the Red dragonfly for $150 with free Prime shipping through Amazon Warehouse Deals in “Used – Like New” condition. They have a detailed description. I suspect these may not last long. The previously mentioned Beyerdynamic offers at NewEgg Flash (DT770 $130, DT990 $150) expire on Wednesday at 3am eastern, but the Beyerdynamic relay race continues at the NewEgg FLASH with a new offer, sold by Beach Camera through NewEgg and running until Sunday night, it is the new condition Beyerdynamic DT 880 PREMIUM (600 ohm) semi-open over-ear headphones offered for $145 with free shipping and a 2-year BeyerD warranty. Limit up to 30 per customer. Synchronized swimming is an Olympic sport. Synchronized price-matching is an Internet sport! The new condition Shure EAYLF1-10 Universal Fit Yellow Foam Sleeves (five pairs) are on sale for $14.29 with free shipping at Adorama and B&H Photo and Amazon actual (free shipping for Prime members, otherwise a $25+ order). As I suspected when I mentioned it last week, a few more days would give us a better in-stock estimate, and they have! As of the time of writing, the new condition RHA CL1 ceramic in-ears have a March 7 in-stock estimate (that’s closer than it sounds because February is a short month) at Amazon by Amazon actual at their sale price of $214.28 with free shipping and up to three pairs per customer at the sale price. Not to jinx it, but it’s nice of them to bring back something that was out of stock for a while at a sale price. Instead of trying to milk those (im)patiently waiting for it. If your DAP or PAD (phone as DAP) is compatible with 200GB microSDXC memory cards, the 200GB Sandisk microSDXC Ultra card is on sale for $63 with free shipping by Amazon actual. This is an old school sale, not a lightning deal, so expiration time is not fixed. Down goes Elear! Earlier in the morning when I was deal-fishing at Amazon the FOCAL ELEAR went for $750, but as of the time of writing, two fulfilled by Amazon sellers (Audio Advisor and Audio Fanatic) have dropped to $699 with free Prime shipping. You can also see the big picture with the detailed listing. I don’t know if those two “fulfilled by Amazon” sellers are authorized FOCAL dealers. The price now matches the FOCAL ELEX at Massdrop which also go for $700. Their “drop” is ending in about one day and change. Unlike the “fulfilled by Amazon” which ships in about two days, the Elex at Massdrop will ship in late April 2018. Patience is definitely a virtue. We go from a $13 item to a $761 item 🙂 The new condition Pioneer SE Monitor 5 closed-back over-ear headphones are currently going for the very specific price of $760.67 with free shipping by Amazon actual. This is not a lightning deal and it doesn’t look like it’s a price-match. The new condition Musou Digital Optical Coax to Analog RCA Audio Converter is bundled with an optical cable and an AC adapter for $13 by Musou with the order fulfilled by Amazon, so Prime members get free 2-day shipping. This has two digital inputs, the yellow coax and the Toslink port, and an RCA output. Per the listing, TOSlink gets priority if both are connected at the same time. It averages 4.1 out of 5 based on 1260+ customer reviews and has 220+ answered questions. There is an on-topic controversy of the earbud kind the headphones sub-reddit. The owner of Venture Electronics, the makers of the famous VE Monk earbuds, threatened to ban any customer who leaves a customer review that is less than “5 out of 5” on their website. This obviously did not sit well with consumers as it is a bad practice. I’ve written an opinion blog-post on this. Spoiler alert: it’s a bad idea! I will monitor the situation and decide what to with regards to future VE deal-posts here depending on whether/how the company/owner attempts to clean up their act. If you are a fan of the KLEER digital wireless technology (as opposed to RF or IR found in lower cost products), also part of the weekly Harman website deals is the recertified AKG K840 KL On-Ears going for $120 with free 2nd-day air and a 1-year warranty. Limit up to five per customer. No, we have not turned into an AKG blog 🙂 The weekly deals of the Harman/JBL online stores have just come out and they happen to have a handful of headphones this week, headlined mayhaps by the recertified AKG K3003i In-Ears going for $500 with free 2nd-day air shipping and a 1-year warranty. The sales typically run Monday up until Sunday (or earlier if sold out). Limit up to five per customer for this model during this sale. It’s A Song of AKG and Bluetooth! The White Walker color scheme of the AKG K845 BT closed-back over-ear bluetooths is on sale for $100 with free 2nd-day shipping and a 1-year warranty at the official Harman Audio store. This is part of their weekly sales which start on Mondays. The Night Watch (black) color scheme is not sale. Monday is here which means another round of weekly deals at the official Harman/JBL stores. The sales including the recertified AKG K-495 ANC On-Ears going for $70 with free 2nd-day air and 1-year warranty. Many of the six customer reviews there complain of bad construction and breakage, so keep that in mind, especially if you are planning to use them in adventurous situations or have a bigger head (the full extension puts more pressure on a fragile headphone). I’ve had a different model of their on-ears and it just broke off at the extension area without any rough handling. Because of my not so tiny head, I had to wear it fully extended. So if you hate returns/exchanges, this is a higher risk item. They are back on the sale cycle, they are the new condition AKAI Project 50X Closed Over-Ears going for $24.99 with free shipping for Prime members or with a $25+ order. Limit up to three pairs per customer. They went as low a $18 last summer where they were doing the “falling knife” thing. They are folding, and as you can tell by the pictures and the name, they are an Audio Technica M50x “homage” 🙂 Their accessories may be worth about half the price of the headphones, two pairs of cables are included (detachable), along with an adapter and a leatherette pouch. They average 3.5 out of 5 based on 220+ customer reviews. The last time we posted about the Blue Microphones ELLA planar-magnetic and powered headphones they were going for $590 in open-box condition, but now they have dripped further down, going for $550 with free shipping in open-box condition by authorized dealer OneCall directly or through Amazon Warehouse Deals. Per the listing, they come with a full warranty. Good until Wednesday night (2/28/18 PM), coupon code SALE3 drops the price of the new condition open-back over-ear Audio Technica ATH-AD900X from $146 down to $131~ with free shipping.